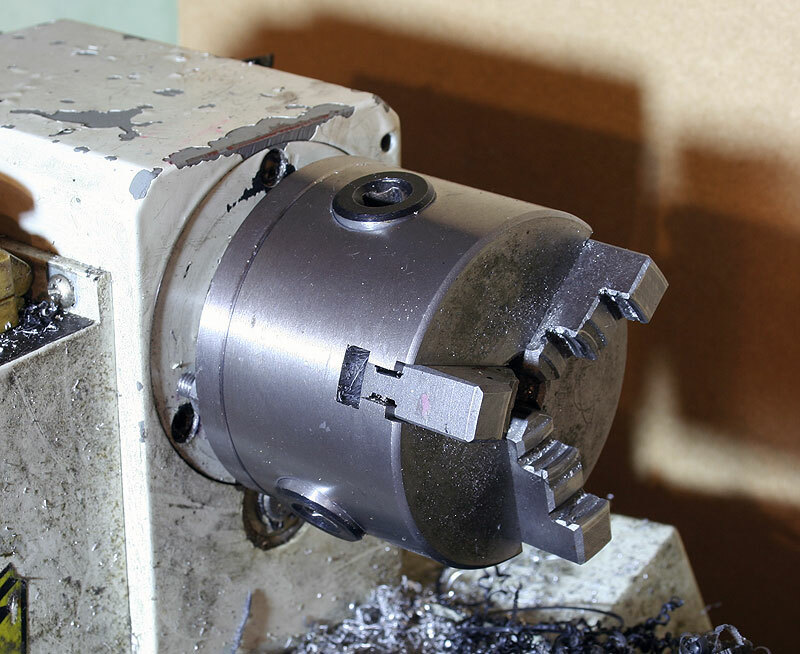 The chuck is a vital component of the mini-lathe, and the main workholding device used on the mini-lathe. Most mini-lathes come delivered with a 3 inch ( 80mm ) chuck with 3 jaws. 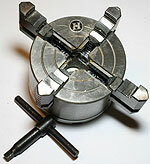 It is a self-centering chuck - which means turning one of the key holes tightens all three jaws at the same time. Independent jaw chucks have one key hole for each jaw. The 80mm 3 jaw chuck works very well for a beginner, and holds round stock (most things we do in our lathes is round) easily and fairly hassle free. However, like all such things, sooner or later you will fancy an upgraded chuck. 3 jaws v. 4 jaws. Size. 3inch, 4inch 5 inch. The three jaw self centering chuck is a joy to use, but is only useful for things which are round. An independent jaw chuck will allow other shapes. In an independent 4 jaw chuck, you can hold square things, and, famously, machine a cube on the lathe. You can muck about and try offsetting things in a 3 jaw, but more likely you will ruin the part and damage the chuck. The other big advantage of an independent jaw chuck is the more accurate centering of work. It is possible to tweak jobs held in the independent 4 jaw chuck so that it has very low runout - much lower than the inherent errors in the repeatability of a self-centering chuck. I think the best single chuck to buy is an independent 4inch 4 jaw chuck. Early in your lathe career, you might want to get a 3inch 4 jaw, but, if you are more experienced, got for the 4 inch. The experience is required because a 4 inch chuck will not fit on a mini-lathe spindle, you must make an adapter plate. You can buy adapter plates, but they probably need finishing. Buying a bigger self-centering chuck is troublesome because your adapter plate must be very good - with an independent jaw chuck, it is natural to adjust out the errors whilst chucking up a part. It doesn't really matter what type of mounting your new chuck has, because you are cunning enough to devise a chuck adapter plate to mount any chuck on your mini-lathe. However, make a point of buying chucks which are recess mounted, as these are the easiest to deal with. A good way to learn about chucks is to remove, dismantle and clean, and finally replace the existing self centering 3 jaw chuck on your mini-lathe. The idea of removing the chuck might seem terrifying to the beginner, however it is a fear that must be overcome - sooner or later your chuck will need cleaning as it gets full up for little bits of metal and becomes stiff or impossible to operate. The first thing to do is mark the orientation of the chuck to the spindle - just scratch a line across so you can put it back in a repeatable fashion. You'll notice 3 nuts holding the chuck onto the spindle of the mini-lathe. Loosen each of these off with a 10mm spanner. put something soft on the bed of the lathe. Chucks are cast iron and dent things if dropped. Including your fingers. Using your set of small fingers, undo the nuts off the studs completely, taking care to hold the chuck on one hand. When it comes off completely you can see the spindle (80mm diameter) with a raised "land" in the middle of diameter 55mm. This is the bit of the mini-lathe we call "the spindle". If you are feeling brave, one of the best improvements you can make to your mini-lathe is to make a VERY light facing cut across the lowered portion of the spindle face, where the chuck rests. Inspect for burrs and bumps as well, and clean away any debris. By taking a facing cut you are ensuring that the face of the spindle is exactly at right angles to the rotational axis of the mini-lathe. If you are feeling extra brave, make sure the sides (parallel to the rotation axis) of the raised land are cleaned up with a light cut, but you don't want to remove more than 1 thou or so otherwise your chuck won't center. Dismantle the chuck, clean in spirit and reassemble with white lithium grease. Hold the chuck onto the spindle with one hand and start the nuts onto the studs with the other hand. The Internet is full of tips for doing this if your fingers are too big, but I have thin fingers. Do all the nuts up finger tight. Use a brass/copper mallet to tap the chuck until the indicator says you've <0.001" of runout. Tighten up all the nuts and re-indicate to make sure. Well done! You've changed the chuck!